Derry City winger Lukas Schubert misses tomorrow night's trip to Galway United. Derry City manager Kenny Shiels feels his side need a 'morale boosting' win at Galway United, in the EA Sports Cup tie, tomorrow night (KO 7.45pm). The Candy Stripes have suffered three straight defeats in a row and Shiels believes his young squad need to get back to winning ways. "It's a big game for both us and Galway and something has to give," he stated. "We need to win, they need to win; most of all for a morale booster to get the morale back and the boys up and running, working hard and playing hard. Doing the things that we were doing well, with a high energy, so we need to get that back and let's use this game to try and get it back." City were very flat and disappointing against Finn Harps in their last outing on Friday evening and Shiels isn't buying into the idea that his players aren't performing because of recent tragedies off the field. "We need to get the energy back into the side and we are short changing our supporters and we have to do something about it," he added. "I think we are just using excuses and it's human nature to do that and try to use excuses for the performances and that's not right to do that, it's so unfair." Shiels confirmed that he's likely to make a few changes to his starting line-up to freshen things up, as the games start to come thick and fast over the next few weeks. "Nicky Low is struggling with a niggle, Lukas Schubert is probably out, he has got a thigh strain, but we'll wait and see," stated Shiels. "We want to freshen things up obviously, it's mid-week games the next three weeks and if we were to win tomorrow night, it will be mid-week the next four weeks, so those are the things we have to do, but we'll take a look at it and see what's best for the team." 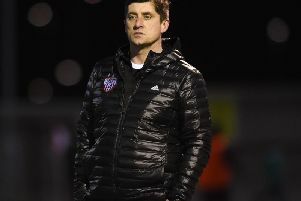 Last season Derry lost to Limerick in the EA Sports Cup semi-final and Shiels also believes a good run could give his side that much needed confidence. "Cup runs are important and we could maybe get through the runs, get some prize money in and that would be great for the club as well. The prestige of getting into the quarter-finals would be good for us as well."